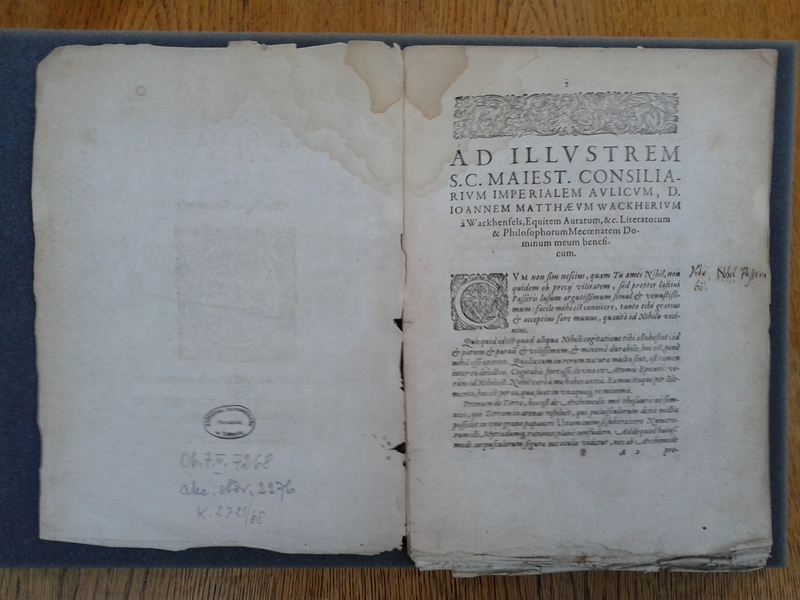 Recently on Provenance Research: The author of “Chronologia Universalis” carries out a preliminary survey in the Special Collections Department of the University Library in Toruń. By a complete accident he receives a copy of Kepler’s Strena that contains marginalia made by a suspiciously familiar hand. 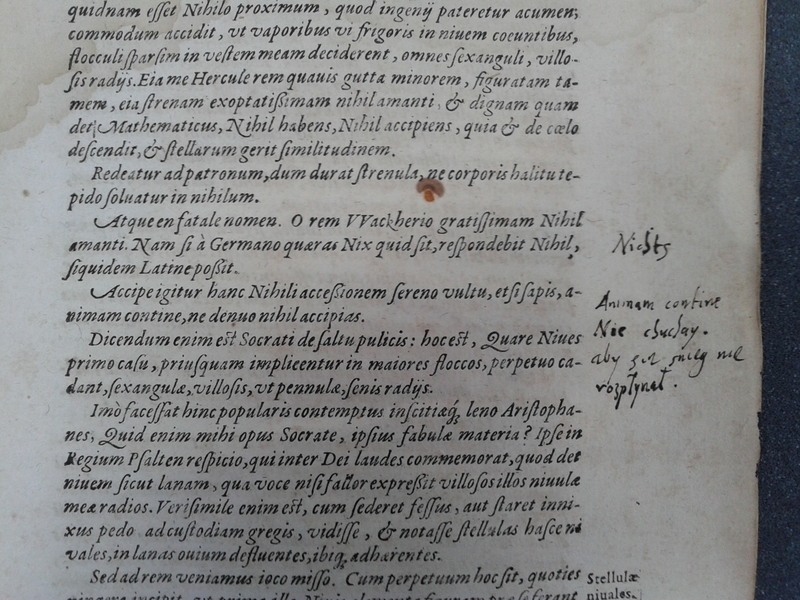 After having a closer look at the notes left by this mysterious early modern reader he realizes that what he has on his desk is a copy that belonged and was used by Joannes Broscius, whom he studied for the past five years and never expected to dig up one of his books here, in Toruń. The author disappears for six months, leaving the mini-series unfinished and marking his existence only with a brief note sent from Galway. The best part of the discovery of Broscius’s copy of Strena is not the fact that the existence of this volume remained unknown to all scholars interested in the marginalia left by this scholar, but the fact that the minor notes he left in his Kepler can be linked directly to one of his own works. It is natural that we, students of Broscius are happy about that, but what makes us even happier is the fact that by this discovery we have yet another piece of the puzzle that can be tied together with particular scholarly effort made by Broscius and have a look at the way he worked with texts that served as direct stimuli for his own work. In his “New Year’s gift”, dedicated to Johannes Matthaeus Wacker von Wackenfels, an imperial councillor at the court of Rudolf II, Kepler tried to solve the problem of the regularity of snowflakes and derive from these tiny ice structures geometrical rules that would underpin the entire reality. As such, Strena should be and is actually being read in the context of the entire corpus of Keplerian cosmology and metaphysics – without that it would be just a geometrical exercise part of which would remain illegible. And although the entire text of Strena is filled with word-plays based on the ideas derived from the vanity of a snowflake and he seems to diminish things he accomplished in his work in the eyes of the addressee, it does not change the fact that the actual goal of his work was quite an ambitious one and went far beyond geometrical observations. Leaving Kepler’s accomplishments aside, one needs to realize that his work inspired a young, 25 years old Cracow scholar, Joannes Broscius, who following the ideas of the author of Astronomia nova, tried to solve the problem of the regularity of the structure of the honeycomb. At the turn of the first and second decade of the 17th century Broscius was at the very beginning of his academic career so his attempt to solve this Keplerian problem should be read as an attempt to enter the world of academic discussion and scholarly publishing. It was in 1611 when Broscius published a quasi-Keplerian work of his own, i.e. Problema geometricum. This tiny brochure in quarto, counting only 7 leaves including the title page, was published in the printing office of Andrzej Piotrkowczyk in Cracow and survived until nowadays only in one copy which is preserved in the Old Prints Department of the Ossolineum Library in Wrocław (shelfmark XVII-847). For Polish-speaking readers the text of Problema is also available through the Polish translation which was published in the second volume of Broscius’s Selected works in 1956, along with his Dissertation on the comet of Astrophil and excerpts from his Apology of Euclid and Aristotle against Peter Ramus and others. The text of Problema was dedicated to Jan Żółkiewski, the castellan of Kiev and son of Stanisław, the Crown field hetman and should be seen as yet another example in the long line of attempts to seek patronage for his scholarly enterprises. No wonder then, that Broscius is trying to convince his noble reader that what is most valuable in geometry is not the beauty of its purely theoretical structures but the fact that these structures can be implemented into the real life practice. In the dedicatory letter, which serves also as a kind of accessus ad auctores, he invokes the authorities of Socrates, Euclid, Archimedes and several other Greek mathematicians in order to convince his patron that the real geometry should be somehow involved in the real life and should be aimed at solving actual problems, making our life more rational and simply better. Since Broscius addressed his later works to other patrons it seems that Żółkiewski either did not find his arguments convincing or was not interested in patronage. Despite this failure, Broscius’s letter remains interesting as an explicit declaration of practical way of thinking about the patronage over the exact sciences. The text of Problema is much shorter than the one of Kepler’s. While Strena has a narrative form and Kepler is leading his reader by his or her hand, Broscius limited the structure of his dissertation to the logical skeleton which consists of nine main propositions (propositiones). His line of argumentation is simple and could be boiled down to a number of theses. Broscius, while examining the regularity of the honeycomb, takes an assumption that the honeycomb structure is not a result of accident, nor is the byproduct of the insect anatomy, but is the direct effect of the general mathematical rules that govern the entire reality. This lead him to yet another presupposition that the geometrical structures that underlie the everyday phenomena are somehow rational and as such are aimed at reaching the greatest efficiency. Having assumed this, he examines the regular figures, the equilateral triangle, square and hexagon, in search for the proof that the last figure guarantees the best ratio of the lenght of sides to the measure of angles and surface. As moder scholars have observed, Broscius argumentation is not free from mistakes as he seems to completely forget about the fact that the honeycomb is a spatial, three-dimensional structure, not the flat drawing on a sheet of paper. This fact should have lead Broscius to the examination of solids made of regular polygons but for some reasons he did not do this, leaving thus his proof incomplete and a bit unconvincing. Among numerous manuscripts left by Broscius and books he annotated the Toruń copy of Strena is the first document that can be linked directly to his work of 1611. What is curious about it is the fact that it does not bring any dense comments about the structure of Kepler’s argumentation, nor does it reveal any information about what he might liked or disliked, agreed or disagreed with in Kepler’s opusculum. The volume also does not help in the search for answer to the question of the incompleteness of Broscius’s argumentation Actually, from the point of view of marginalia lover, this volume could be treated as a real disappointment – only few minor annotations, most of them based on the phraseology of Kepler’s text and one attempt to render Keplerian phrase in Polish does not make one’s hart beating faster. But for me the lack of marginalia makes a memento that the chase for annotations has its own limits and rules and that the process of reconstruction of one’s reading list and working methods is not a mechanical activity. It would make things much easier if Broscius annotated everything, laying his cards on the table and leaving them to the future researchers. But this is not the general rule, neither in case of Broscius, nor in the case of any early modern reader whose library survived the historical turmoils. And such ‘negative facts’ as the lack of long and rich annotations in a text that was the main inspiration for creating one’s own work as well as the lack of references to this inspiration in the published text are also meaningful. What’s the moral of this Serendipity Trilogy, then? I guess I can draw at least two. The first one is quite obvious: you should keep your eyes open, expect everything and let the collection you are working with surprise you. The second one is a preliminary observation: the history of not-annotating or not-leaving notes is the inherent part of the history of the book and reading and the lack of notes does not mean by necessity that the unannotated volume did not play role in the creative process and served merely as decoration. A week ago, in the first part of this tripartite story about serendipity in provenance research, I gave you some general information about the context of the accidental discovery I made. 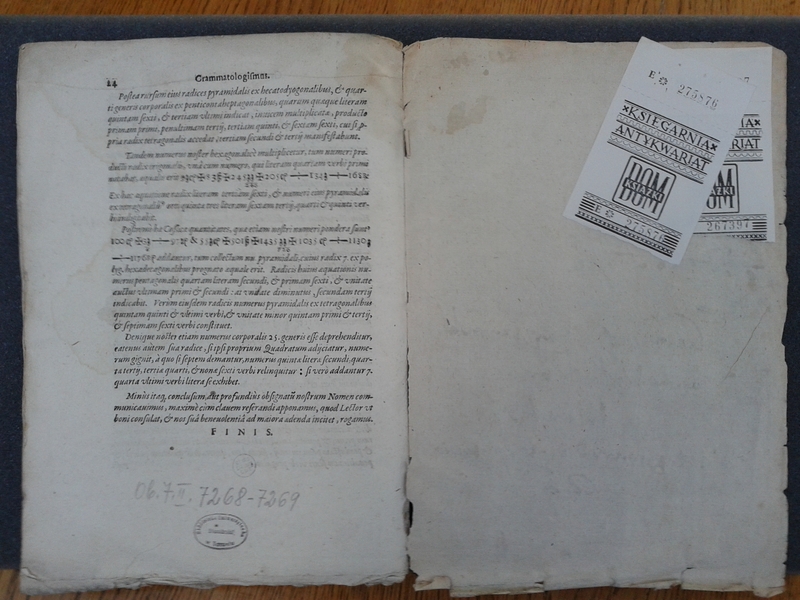 On Thursday, July the 3rd, I continued my survey at the special collections of the University Library in Toruń. I decided to move from the manuscripts gathered at this library towards the regular analysis of the provenance marks left in the works by early modern chronographers and astronomers that are available at this particular library as I still have only a cursory knowledge of both the character of this collection and its ownership structure. As usual, I filled in a number of order slips and started to leaf through the subsequent volumes in hope of finding some early modern annotations. Nothing unusual happened, the pages were clean as if they came freshly out of the printing press, until I received an awkward-looking cardboard box with multiple titles. It was not a regular book-block or sammelband as the brochures gathered under a series of consecutive shelfmarks were never bound together and were not even related to one another by a common subject or author. Apparently, the librarians gathered them together due to their relatively small size. What alerted me right after I opened the box was the fact that two titles with the lowest shelfmarks were actually missing. After a quick verification it turned out that two of the items which should be in the box were removed as they did not fit exactly into the box’s format and could be easily damaged. The title I was looking for was one of minor works by Joseph Scaliger, i.e. his commentary to De tribus Judaeorum by Nicolaus Serarius, so I asked the librarian on duty to bring me this particular position. This, however, was not the end of the whole confusion as I wrote the cipher 5 in the Scaliger’s shelfmark in such a way that it was read as 6. 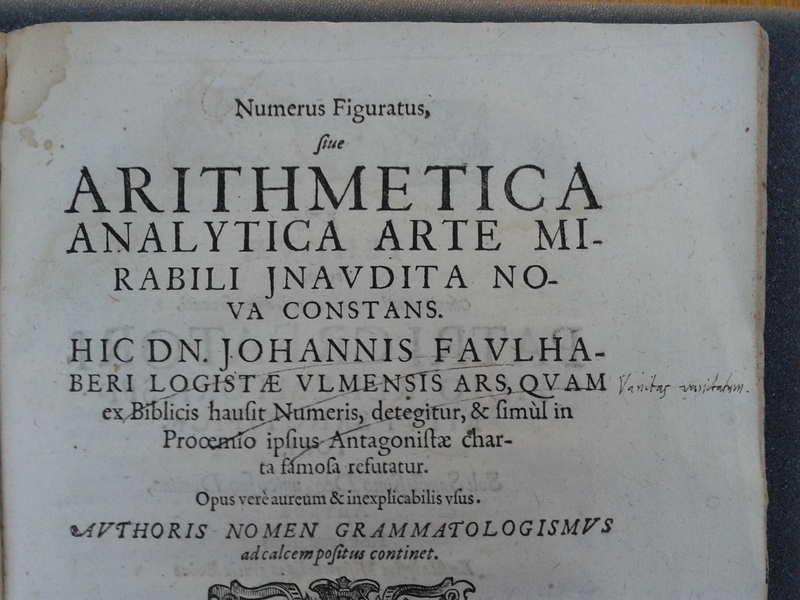 Thus, by a pure accident, I received a completely different title and since it turned out to be a work of Johannes Kepler I decided to have a look at it. I opened the cardboard wallet and what I saw was a poorly preserved brochure without any binding but with damaged page edges and some occasional, light brown stains. 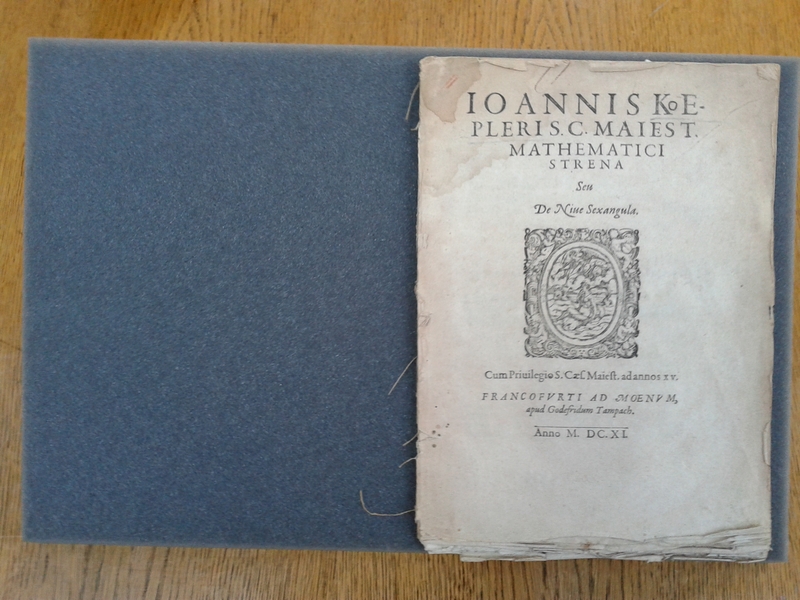 It was the 1611 Frankfurt edition of Strena, a minor yet quite interesting work of Kepler’s. I never read it in the original until now but I knew it through it’s recent Polish translation. I turned the page carefully and what I saw on the margin of the next page (i.e. sig. A2r) made me to look around and make sure if I am actually sitting in the reading room at Toruń as the shape of the letters left next to the opening paragraph of Kepler’s dedicatory letter seemed oddly familiar. Five years ago, when I came to the Old Prints Department at the Jagiellonian Library and ordered my first book annotated by Broscius in order to prepare a paper for the Cracow workshop of the “Cultures of Knowledge” project, the librarian on duty opened the volume, had a look at some random pages and said that this was definitely his handwriting. Then I was ready to assume that being able to tell the difference between various early modern hands was a symptom of lunacy and that it was nearly impossible to give such a judgment after having just a quick glance at some minor scribble. After all these years, when I got accustomed to Broscius’s handwriting and transcribed hundreds, or maybe even thousands, of his words, including a rough draft of hist 1652 Apologia pro Aristotele et Euclide, I feel quite confident when I am asked whether it is his handwriting or not. Moreover, I can say that I fully understand the Cracow librarians and their level of familiarity with Broscius’s hand and I am actually ashamed of my past lack of belief. Although I still experience some difficulties with reading some parts of his manuscripts as some of them are blurred and some of them are simply so tiny it is really difficult to tell the difference between certain letters but despite that, I have the general idea of how he wrote particular letters, how he marked interesting passages, what types of ink or pencil he used, in which places of the book he used to leave notes, etc. and this knowledge, a classical example of learning by doing, substantially facilitates the process of verification of subsequent annotated volumes. When I turned the page of the Toruń brochure I saw another annotation left in the margin of fol. A3r. This time it was in Polish and it read as follows: “Nie chuchay aby sie snieg nie rozpłynał”, “Don’t breathe on the snow as it will melt”, which is not an entirely meaningless comment if you take into consideration the fact that Kepler’s work was dedicated to the problem of the regularity of snowflakes and then I become absolutely sure that what I am looking at is in fact a working copy of Kepler’s Strena which belonged to Broscius! Until the 3rd of July, I thought that I will always study Broscius’s manuscripts in the reading rooms at the 2nd floor of the Jagiellonian Library. This assumption turns to be false and the University Library in Toruń should be added to the list of libraries which have Broscius’s libri annotati. From the price tags attached to the final page of the volume and the year included in the acquisition number on the verso of Kepler’s title page, it appears that the volume was bought in one of the Dom Książki state-owned chain of antiquarian bookstores in 1968, althought it is not clear how these titles got into the antiquarian book market. It is highly possible that the works of Kepler and Remmelin dissapeared from the Jagiellonian Library in the 19th century and were included in one of the private collections. After the twentieth-century turmoil, these collections must have got dismantled and at least part of them found its way to the antiquarian bookshops and since the research questionnaire of the Toruń librarians was and is completely different from the one applied at the Jagiellonian Library, it is not a surprise that these annotations have escaped their attention. However I am really happy about this accidental discovery, this is just the beginning of the actual research work. And since I made an observation that marginalia left by Broscius can provide some additional information about his scholarly workshop and the works he actually published, in the third and last part of this serendipitous cycle, to appear in a couple of days, I will make a preliminary attempt to explain the origin of marginalia in Kepler’s Strena. Stay tuned if you wish to know why Broscius bothered with melting snow and how Kepler’s snowflakes are related to research carried out by the Cracow scholar.